Ryan hunts dear near Medill, Oklahoma, Nov. 23, 2011. No points for guessing who came up with Paul Ryan's Secret Service code name. The outdoors enthusiast and unrequited Rage Against the Machine aficionado reportedly picked "Bowhunter" himself, because, well, that's what he does. The information comes courtesy of the website of GQ, quoting an unnamed campgain staffer. 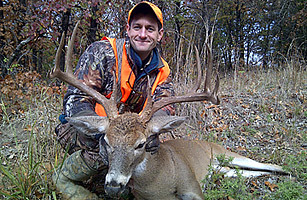 As SFGate.com also reports, the Wisconsin congressman is even set to appear on the cover of the hunting magazine Deer and Deer (although pride of place is given to a picture of a massive buck). Ryan's wife Janna is reportedly codenamed "Buttercup", in keeping with the Secret Service's tradition of adding alliterative code names for members of the protectee's family. No word on how many terms beginning with J they've managed to come up with for Mitt Romney  codename "Javelin"  and his five sons.